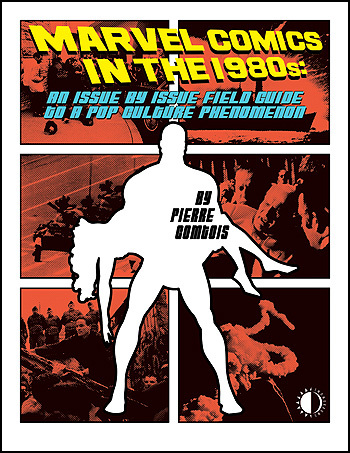 Shipping this week is Marvel Comics in the 1980s, the third volume in author Pierre Comtois‘ series of issue-by-issue “field guides” to the company that has become a pop culture phenomenon. While the two previous volumes dealt with the 1960s and 1970s Marvel eras, this new book covers Marvel’s final historical phase, when the movement begun by Stan Lee, Jack Kirby, and Steve Ditko transitioned into a darker era that has yet to run its course. The 1980s saw Stan Lee’s retreat to the West Coast, Jim Shooter’s rise and fall as editor-in-chief, the twin triumphs of Frank Miller and John Byrne, the challenge of independent publishers, and the weakening hold of the Comics Code Authority that led to the company’s creative downfall—and ultimately the marginalization of the industry itself. Comics such as the Chris Claremont/John Byrne X-Men, Frank Miller’s Daredevil, the New Universe, Roger Stern’s Avengers and Spider-Man, the new wave of dark heroes such as Wolverine and the Punisher, and more are all covered, in the analytic detail—and often irreverent manner—readers have come to expect from the previous 1960s and 1970s volumes. However, the 1980s represented years of upheaval in the comics industry—with Marvel at the center of the storm—so expect a bumpy ride in this book’s coverage of the 1980s decade that marked the beginning of the end of Marvel Comics as readers knew them! The book is also available at Amazon.com, and through TwoMorrows’ app on the Apple and Android platforms.